Building an outdoor fire pit creates an inviting place to entertain family and friends. Fire pits can be used to cook food, provide warmth and to roast marshmallows. Fire pits can be as crude as a hole in the ground covered by rocks or as elaborate as a pit built into a concrete deck surrounded by stone. You can build a pit in a variety of ways with inexpensive materials found at home improvement stores. One option is to use your old gas grill in the construction of the fire pit. Always ensure that any open fire is completely out before leaving it unattended. Shut off the gas supply to the grill. Loosen the retaining fitting securing the hose to the tank with a pair of channel lock pliers. Pull the hose carefully off the tank and lift the tank off the grill. Open the lid of the grill and slide the inside racks out of the grill. Place them to the side. Lift the lava rocks up and out of the grill and discard in a trash can. Scrub the inside of the empty grill with a wire brush to remove debris and rust, then wipe the inside of the grill clean. Set the racks back into the grill. Find the burners under the body of the gas grill. Loosen these burners with an adjustable wrench and pull them off the grill frame. Place the burners in the trashcan. Remove the gas controls and any remaining accessories from the grill with the adjustable wrench. Discard the controls and accessories. 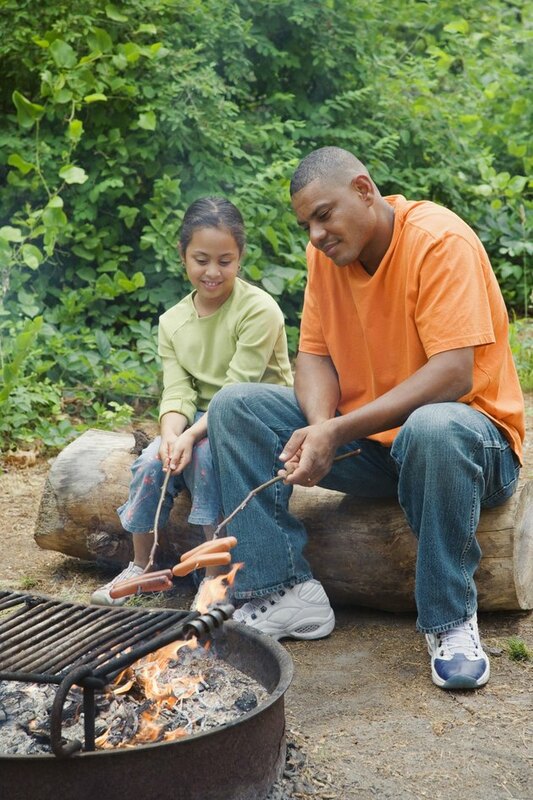 Dig a hole that measures 1 to 2 inches wider than the diameter of the grill. The hole should be 6 inches deeper than the grill. Place a 6-inch layer of drainage gravel at the bottom of the hole. Set the empty grill body into the hole. Place your hands on the edges of the grill and press down slightly to set the grill into the ground. Fill the gap between the grill and the hole with gravel safe for use in fire pits. Place a row of blocks that have angled sides so they form curves when placed against one another around the perimeter of the pit. Cover the top of the blocks with masonry adhesive. Set a block on top of the adhesive covered blocks. Center the block over the seams of two blocks. Continue in this manner until you have a second row of blocks. Wait 24 to 48 hours to let the masonry adhesive dry before you use the fire pit.